I’ve teamed up with a group of bloggers to offer my readers a fantastic prize package! 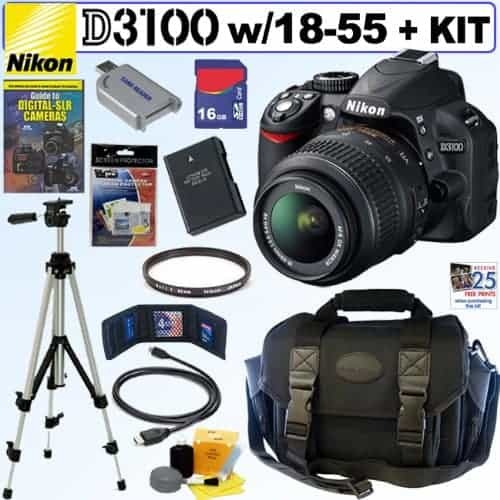 One lucky person is going to win a Nikon D3100 14.2MP Digital SLR Camera with 18-55mm f/3.5-5.6 AF-S DX VR Nikkor Zoom Lens + EN-EL14 Battery + Nikon Filter + 16GB Deluxe Accessory Kit valued at $749.99! The giveaway is open worldwide. If a non US resident wins they will receive $650 Paypal instead because of shipping restrictions. I use photography as a form of release, without photography I would probably honestly be dead. I would love to win this. My daughter was just recently accepted into the College for Creative Studies majoring in photography. She could really use a better DSLR than my old Nikon. I would absolutley LOVE to have this so I can take MARVELOUS pictures of my BEAUTIFUL granddaughter ! You’re temporarily blocked from making public comments on Facebook. Some of your comments have been reported as spam. To avoid getting blocked again, make sure your posts are in line with the Facebook Community Standards. My wife and I would love the chance to win a camera like this. We have wanted one for some time now, but have not been able to justify spending that kind of money on it. Good luck to whoever wins it and thank you for the opportunity to win it. Thank You for this opportunity to win such an awesome prize package. If I win, my daughter will be over the moon! wow, what a great giveaway…summertime, lots of photos of the kids, family travel…nice! Thank you so much for the chance to win this awesome prize! with this camera ..a picture is worth infinite amount of words. Hello Stacey!! Just got an email saying I won this wonderful prize package!! I am SO EXCITED!!! I will certainly put it to good use………..was very much into photography many years ago, took some college courses………hope I can rememebr what I learned!! At any rate, I will certainly have fun re-learning and experimenting!! Thank you, so much, for this great opportuniy and great win!!!!! Just received my great prize via UPS today!! That was FAST!! Now, I wonder what I’ll be doing the next few days??? I think I may be learning how to use my nw camera and all of the ecoutrments!! VERY HAPPY AND EXCITED!! Thanks for such a wonderful giveaway!!! i love takeing pictures all the time. this camera is alsome . and im a huge nikon fan ! i think enyone would be luky to win this….. good luck to all ! I would love to win.. I need the equipment for school..